Can magnets hold a holiday wreath to a door? What magnets should I use? Can magnets be used with a door that isn’t steel? Can I toss a wreath to a door from 10 feet away and make it stick? This month, K&J answers these practical and silly questions alike. What magnets can hold a wreath? 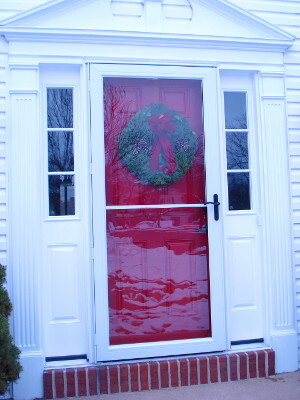 For hanging a wreath on a steel door, we like the WPH-SM or WPH-LG magnets best. These hooks are made with neodymium magnets inside a water resistant, plastic housing. They are specifically designed for holding a weight on a vertical surface like a steel door. Their rubbery contact surface provides enough friction to help prevent sliding down the door. We show both of these in the short video clip below. We found that the smaller WPH-SM magnet was just barely enough to hold a good-sized, 4 lb wreath. In a protected space behind a storm door, this might be enough. The extra strength of the larger WPH-LG felt more secure. If it’s windy, consider this size. Thanks to the folks at Wreaths of Maine for donating the beautiful wreath for our mad, magnetic demonstrations. No magnets or wreaths were harmed during our testing. Plus, now our offices smell wonderful! What if I want to hide the hook behind the wreath? Using the same WPH-LG magnet, we show a way to keep the hook behind the wreath. The hook is more hidden this way. We removed the hook and attached the wreath in its place. It’s a nice, secure solution. We also tried hanging the same wreath using our HOOK-BLK magnets, but they weren’t nearly strong enough. That smaller size is great for holding up an apron, but not something as heavy as the wreath. Our strong Mounting Magnets are another choice to consider. We tried a powerful MM-E-42 magnet with an MM-RC-42 rubber cover. This is a strong magnet, but the weight of the wreath pulling on the end of that hook had enough leverage to pry it off. This magnet isn’t the best for hanging something on a vertical surface (i.e., a wall or door). To make it work, you would have to hang the weight much closer to the door, rather than out at the end of the hook. If you’re just looking for the right magnet to hang a wreath, that’s it. We've covered our recommendations. You can stop here. What follows are some crazy demonstrations to answer some questions we get from time to time. They are NOT anything we would recommend. Please don’t hang anything this way! What if I have a wood door? Can I use 2 magnets, one on each side? No. We don’t recommend this. At all. The pull between two magnets separated by a thick door is very weak. You won’t get enough strength using reasonable magnets. But wait, what if we don’t limit the size of the magnet? Is it physically possible? Well, sure. We have some ridiculously powerful magnets here at K&J. We can certainly pick two huge ones that will hold through a door. In the video below, we took two surplus, ZD10 disc magnets. These disc magnets are nearly 2” in diameter, and can attract to one another with over 150 lb of force when touching! You would find these magnets very difficult to separate from one another (see How to Separate Strong Magnets). They are not safe to have casually laying around the home. If mishandled, they can cause serious injuries. At the very end of the video below, we show what happens when two of these magnets get close to one another. For safety, we kept them separate using a thick board. If you’re curious about what happens when magnets like these actually collide, check out our video, When Magnets Attack! Can we tie a big magnet to the wreath so that we can toss it on the door from a distance? For this demo, we tied a BY0X08DCSPC-BLK plastic coated block to the wreath with a piece of string. Then, we stuck a rubber coated BY0X08BR-N52 magnet to the first magnet. These coated magnets are more durable than plain magnets. If we used a plain magnet, it might crack, chip or shatter upon impact. Also, the rubber coated one has really great, grippy surface that prevents it from sliding down. Imagine the wreath delivery boy biking down the street, tossing a wreath on every doorway… Happy Holidays!